Welcome in success and auspicious energy with this energizing 5 Elements Victory Banner ! The five flags signify the five elements – Water, Wood, Fire, Earth, and Metal - and represent harmony and peace. All five flags multiple together and attract an abundance of fortune and blessings to your life. 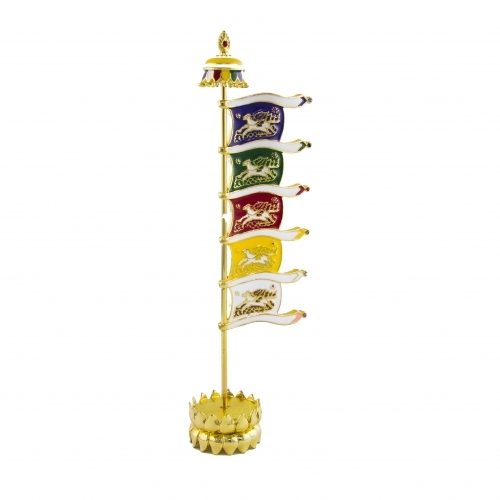 The amulets printed on the flags each bring in a different kind of good fortune, and allows you to remain dedicated and successful throughout the year. The overall dimension of this feng shui Five Element Victory Banner is approx. 2.5" x 1.5" x 8.25". It is made of metal.